Wednesday, May 23/Catahoula Hotel (914 Union Street): People love the movie Empire Records so much that they often want to scream Rex Manning’s name from the rooftops, and you might get your chance on Wednesday. The Catahoula Hotel will be screening Empire Records on the rooftop, so Rex Manning Day has come early this year. The film rolls at 8:00 PM, but you might want to arrive a bit early to secure a cozy spot and grab food from killer Puerto-Rican pop-up Así! For full details on the screening, check out their event page here. Thursday, May 24/Dogfish (2448 N. Villere Street): Anne Gisleson and Kelly Harris are coming to the Dogfish reading series, and they will be reading this Thursday from their publications. Anne Gisleson is the author of The Futilitarians, and her writing has appeared in The Atlantic, The Los Angeles Times, The Oxford American, The Believer and many other publications. Kelly Harris will be reading from her multi-media poetic essay, “Dear Naomi (and Black Girls Everywhere).” There will be light food and refreshments served, and it all begins at 7:00 PM. For full details, check out their event page here. Friday, May 25/Carousel Gardens Amusement Park (1 Palm Drive): Toot! Toot! You know that cute little train in City Park? It just got a whole lot more interesting. You can now board the miniature train at City Park’s Carousel Gardens Amusement Park for a historical tour of New Orleans City Park. 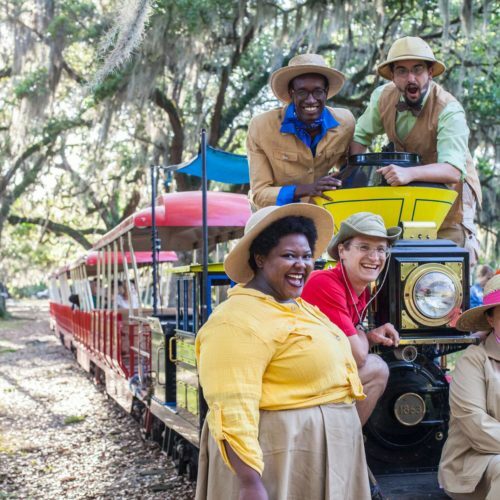 The train ride features a trio of singing tour guides, a bite-size version of the Park’s early history, and a catchy New Orleans rhythm & blues score you’ll be humming for weeks. You can hop on the train three times a day for the weekend, and the tickets will cost you $20, which you can purchase here. For a full schedule of rides and times, check out their event page here. Friday, May 25/Pythian Market (234 Loyola Ave): Pythian Market, the highly anticipated urban food collective located in the historic Pythian Temple in New Orleans’ Central Business District, will open its doors to the public on Thursday, May 31. To celebrate the opening, they are inviting the neighbors to a soft opening lunch with limited hours. All of the vendors will be offering 50% off discounts on their menu items, which vendors like 14 Parishes and Bar 1908 to Central City BBQ and Cru. The market extravaganza begins at 11:00 AM on Friday, and for a full list of vendors, check out their event page here. Saturday, May 26/New Orleans Lakefront (Lakeshore Drive): The time of year when people get out their cars and gawk at them is here again (to be fair, that may happen more than once a year, but this is the one we are highlighting). On Saturday, bring your daily, race car, lifted or slammed truck, stance cars, motorcycle, exotics, rat rod, etc. and check out the car culture nola and surrounding areas has to offer. It all starts at 10:00 AM on Saturday, and if you stay until Sunday, they are holding a meet-and-greet at Nola Motorsports Part to see who can win the title of fastest kart driver at lakefront meet. For full details and directions, check out their event page here. Sunday, May 27/Bayou St. John: The bayou is getting serious action with Zulu, Bayou Boogaloo, and now the Greek Festival will be taking over the banks of the bayou. The 45th Annual Greek Festival starts on Friday, May 25, and on Sunday they will have a re-enactment of Bienville’s 1699 voyages on the Mississippi River and Lake Pontchartrain. Members of the Isle de Jean Charles Biloxi-Chitimacha-Choctaw Nation and Bienville will ride a pirogue down Bayou St. John and join us at the Festival to commemorate the 300th Anniversary of New Orleans.The re-enactment begins at 2:30 PM. Tickets for the Greek Festival are $8, and you can purchase them here. To see what you get with your ticket visit the Greek Festival’s website.